"Tottenham rock. Said you gotta forward down the track. When I take this stop I said I won't be coming back. When I play my musical shock attack, the sounds-like the Tottenham rock as I would tell you. Say so. Jah know." Owner of the sound: K. Gordon - (Fatman). How did you first start moving around sounds? Fatman: "Bwoy, just thieving out of my house, going to dances and getting beaten from a youth. That's how I really started out." Fatman: "Is a whole heap of different sound. Different sounds from all them times there, like Coxsone sound, Duke Reid sound, Blackbeard sound, all different type of sound. I didn't have no special sound to go and listen, because I couldn't go in the dance. I could only listen to them outside." Fatman: "I grow with my aunt and she was over here, so she decide to send for me. I didn't really want to come but, you know, she get pretty strong about itso I have to come here then." You always live North London? Fatman: "Always in North London over since, yes." Tell us something about Sir Fanso. Fatman: "When I come to North London, after I was staying home for a couple of weeks, I start going out now and trying to find a sound to go and listen to. The first sound I come across was Sir Fanso. So I started to listen to that sound and start getting in with them, and then I start going around with the people. "Used to play in places like Grays Hall and the Sunset, Grays Hall in Seven Sisters Road, Tollington Park Ballroom and all the town halls and thing like that, but Fanso normally used to rule Finsbury Park and Tottenham." Fatman:	"Well yeah, we used to play in Stoke Newington area as well. Fanso used to play Stoke Newington area, but we never used to play a lot in that area like how we used to play in Finsbury Park and Tottenham." Who would be the ruling sound in Stokie at that time? Fatman: "Stoke Newington. In them time. Well, ever since I come is always Chicken the Thunderstorm, when it comes to house dance is always Chicken the Thunderstorm I hear about from ever since in Stoke Newington, and Shelley, Count Shelley." Is Chicken the Thunderstorm the same Chicken Hi-Fi who still plays out in Nl6? Fatman: "Yes, is the same Chicken. I think him should be a fowl by now. "Yeah Sir Fanso, as everybody. knows, if you mention Fanso, Fanso was a great sound in them times, was ever forward. That's why we really stick with Fanso, because all the rest of sound in them times them never putting over what Fanso really putting over." What sort of music were you dealing with? "Roots music, reggae music same way. Them days was just a breakout from bluebeat really, and Fanso used to play everything; the sort of people -him play for, well it used to younger generation." What artists did he play? Fatman: "Artist like wha', Slim Smith, and all them artist like Alton Ellis." Ribs: "We used to have them on soft wax. We never had dub in them days. Soft wax. Fatman: "Same thing what them refer as dub. In that time we used to call it soft wax,"
Ribs: "Them used to have wha', Justin Hinds, Alton Ellis, all them artists there he had them on wax. Ken Boothe, all them man there." So he used to check mostly for Treasure Isle music? Fatman: "Yeah, him used to play a lot of Treasure Isle music, and Studio 1." From where did he get them? Fatman: "He used to get them direct from Jamaica." Ribs: "They were from the studio them, you know, and the producer them." So he operated in a similar way as you now with Prince Jammy? Fatman: "Yeah, the same thing." You became DJ with the sound, Fatman, the mike man. So how would you toast a sound? What would you say? Give a demonstration, as if you was at a dance. Fatman: "Bwoy, that's why I was referring to these people. If you can remember how these people used to sound, you know, you can really picture me then. I was really hard in a them time. Like it was a little skaville, you know what I mean?" Fatman: "Just a little skaville." How long were you with the sound? Fatman: "About six, seven years." Then he went home, right? Fatman: "Who? Fanso went home? Yeah, he went home, went back to Jamaica. Carry his sound as well and played out in Jamaica." How did that leave you? "The last sound I go out and listen to before I decide to build my sound was Sir Dees sound playing out in Tottenham, and I stand up the night and listen, and it coming like the music the man of Dees did play is music what Sir Fanso did stop play longtime. I just come out and go home a my yard and I decide say I'm gonna build a sound. Fatman: "It was about '74. You use the names Wild Bells and Imperial Downbeat for while. Fatman:	"Yeah that time the name me really promote with was Wild Bells, but we didn't use that name for long until I come with Imperial Downbeat. The reason why I didn't use Wild Bells, at the same time a guy named Eddie he started a sound as well, and he give the sound name Bells. So saying Wild Bells and Bells, it could come in like it was the same talk. So I just switch and say Imperial. Imperial Downbeat." How long were you Imperial Downbeat? the sound start getting popular and I start getting bigger. The people them named me, the people them named me Fatman. It was the people them did. "So we just got to make the name of the. sound Fatman Hi-Fi. That's how the name Fatman come about. So is really the people, that's what I'm say. Hornsey, Finsbury Park and them set of people really start off the name Fatman, which I never really care whether the man call me fat man, or maga man, or what." Where did these Hornsey people come to hear you play? Fatman: "To listen the sound? We really used to play in house dance, house dance was the craze at those time, and town halls and places like that." Fatman: "Yeah, always the same Finsbury Park, Tottenham, Hornsey." You maintain a teenage following over the years that establishes Fatman Hi-Fi as the patron sound of North London youth from time. You do say once, though, that you build your reputation in the early days playing to an older type of crowd. Bluesville in Wood Green. We started in Bluesville, then it was pure youngsters going to Bluesville, you see, so them break away from the sound. The bigger folks them break away from the sound and it's just younger ones them started coming now, and Bluesville was packed until we left. We left Bluesville, we went to Red Lion in Leytonstone. There it was pack out as well, and went on there for quite a while, until we left there and go back to Wood Green again, down in Nightingale pub." Why did you keep leaving these places? Fatman: "Well, they just keep closing down." "Come make we step it go to Clapton Common, come make we step it go to Dalston Junction, and then we gone a Stoke Newington, ca' that there time we gone down to. Tottenham, man say. I said when night come, when night come, when night come a me fe have some fun, me go a Cubies, me go a Phebes, me go a All Nations, me go a Ball Hal, me go a Four Aces." Why do they keep closing down? Fatman: "Well I don't know. Up to now we don't find out the reason why, but wherever reggae music is, from them time until now, you always find out as soon as you get say over 200 people inside the hall, you find out say it run for a little while, and then you just hear say you can't come back. "From ever since that been going on, and is still going on now. I mean, you can name the clubs them on one hand which is going from say in the 60s. Other clubs where you get, a funky club or a pop club or any other different club, you'll find that they're still going on, or a jazz club and all them things; but wherever you used to have reggae music, they never continue. As soon as the kids them start coming out, closed door. Maybe they're frightened of the music. they must be frightened of the music, because whoever is closing down the clubs, the don't come here. That's a good way of putting it, they might be frightened of the music. "You really have a strong heart to really face reggae music and the type of sound wha' we really play. 'Cause the sound wha' we really play, if your heart weak, you come inside you drop. Just drop." You used to play youth groups at 10p a head. Fatman: Yeah. We used to play for Pastor Morris club. When Pastor Morris used to run a youth club in West Green Road we used to play for him there. He used to charge 10 pence a head, but we were only playing to keep the youths them off the street, you see, we didn't really play to say make anything out of it. Is just something for the club, that 10p would go to the club and things like that. "But even although we was playing for nothing still, that only went on for awhile and then they close it down again. Them have to move I." You keep finding new places, however, in which to play. Playing country seems to be a big thing with your sound at present. Why is that? Why have you moved to the country? Fatman:	"We don't really move to the country, but people want to hear us everywhere, that's why we don't even settle in London at one spot. We can't stay one place, because if we are one place everyone keeps phoning in and say, well then Fatman I want you here so, I want you there so, I want you everywhere you know. So it's best for us to go all over the place and spread the good sound of reggae music all around, than stay in one place with it." Fatman:	"No-o. We don't see weself as a circus. We see weself as a mobile radio station for reggae music. It's the only way for the people them who really want to come and listen reggae music. It's the only place them gonna hear it is to go and listen to a sound system, because them nah hear it upon no radio station." They can hear it in the record shop. Fatman:	"In the record shop! But if them don't come to the sound system and listen, them have to come and listen what the sound is playing and what the deejays, that's why we have deejays, the selector play the record and the deejays put it over to the people and tell them what record's been played, you see, so them take down that now and then them go to the record shop. labels. It would be really hard for a man to go into a record shop and just stand up and listen 'til him hear a record him want to buy." 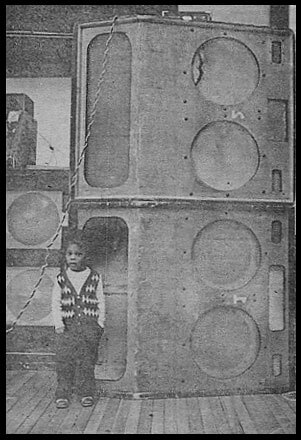 Sound systems when they started didn't see themselves as a radio station for reggae music, however. They were not playing reggae for a start, they was playing American music, right? Fatman:	"From ever since I know sound system, is always reggae music them play. There again, you might be seeing a different sight of sound, because you have sound system and you have disco. Disco is where you play soul music and things like that. But from ever since, all the whole sound man them what me hear from this country go right back to Jamaica is just reggae music, or bluebeat or ska. Is not none of them no play them sort of music there." Talking about American music people like Louis Jordan and Fats Domino. Before bluebeat. Fatman:	"You're going back from the days of blues, rhythm and blues. Well, rhythm and blues kind of come in with the same views with ska music. Them days you never used to have reggae, so them days them man there used to mix them type of music then along with Dodd's (Studio 1). That's how them used to play those music. They didn't have a wide range of music like we have now in reggae music to play, so the art was to play a bit of shufflers them." It is singular the different paths the two musics have taken considering they both come from rhythm and blues: soul, or rather disco, and reggae. Fatman:	"Yeah, they all travel along the same line." But they go off in different directions. Fatman: "Right. Even the people that go to listen them go off in different directions, because the man them who go and listen soul music they won't come and listen to reggae music, and who listen reggae music they won't go and listen soul music. "You hang about a club well in Manor House you hear them say, bwoy is a soul club that, you won't find reggae people going there. Likewise, the soul people won't come to the reggae thing. "It come in even on radio station. If you hear, them have a three and half hour of reggae music, and you have that feller deejay, him play is pure soul, him won't even play a reggae music. So that's how it is in the dance hall now." Fatman:	"Well, I don't know, is probably them themselves. Because some people might say is just punks go and listen to soul music, and then the soul people them might say bwoy is just pure Rasta go and listen to reggae music, so they don't want to go there, them don't want to mix. It's not really the music itself, but probably is just the people." Would you like to see yourself playing Wembley Stadium say, and 100,000 people there? Fatman: "We're not drawing a line from nowhere man. We want to play in all the top places. We want to see our reggae fans come to places like that. That's where we would really like to see reggae music. Everywhere. Comes a time when we would really like to say we can drive our van and go and tour all the continent and just play reggae music." Fatman: "Comes time when we won't just be driving up to Birmingham or Manchester or Wolverhampton or wherever. We will be heading the ferry, you know. Man say, where you a go this week Fatman? We say, bwoy Paris we a go. Them way there."